This delicious and impressive chocolate cake is the perfect dessert to serve at your next party or casual get-together. Cover bottoms of 2 (9-inch) round pans with parchment; spray sides with cooking spray. Beat eggs in large bowl with mixer until blended. Gradually add granulated sugar, beating until thick and lemon coloured. Add dressing and vanilla; mix well. Combine flour, 3/4 cup cocoa powder, baking soda, baking powder and salt. Add to egg mixture; mix until blended. Gradually add hot water, beating after each addition until well blended. Pour into prepared pans. Bake 30 to 35 min. or until toothpick inserted in centres comes out clean. Cool cakes in pans 10 min. Remove from pans to wire racks; cool completely. Beat butter, semi-sweet chocolate and 1/3 cup cocoa powder in large bowl with mixer until light and fluffy. Gradually add icing sugar, beating after each addition until well blended. Add milk; mix well. Stack cake layers on plate, filling layers with 3/4 cup icing. Frost top and side of cake with remaining icing. 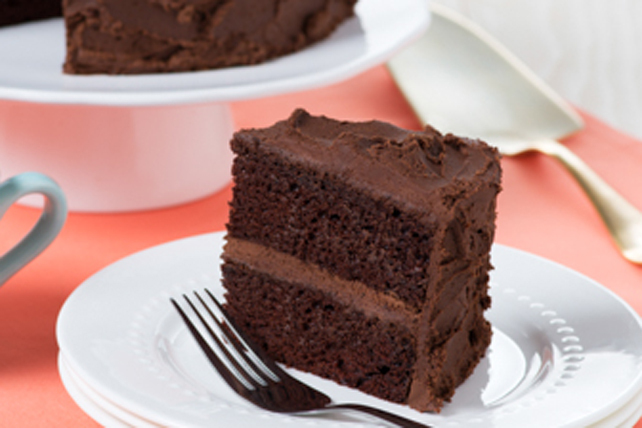 For a mocha-flavoured cake, substitute hot brewed strong Maxwell House Coffee for the hot water.